Well, are they? I often see other families with children inappropriately restrained in their cars and it scares me to think about the very real and potentially devastating consequences that can happen, regardless of how carefully they drive. After all, we are all at the mercy of our fellow road users, and we have all encountered the crazy drivers who drive like lunatics and who do not seem to care about the safety of other road users. Haven’t we? There is often a lot of confusion about what the laws and recommendations are around the use of child restraints in cars in Australia, and social media often confuses us further with information from other countries like the UK and the USA. I thought I’d take this opportunity to share the most basic information we, as parents, should all be armed with when it comes to choosing the right car restraints for our children. I’ll do my best to make this as straightforward and non-confusing as possible! Now, this can be a contentious point, but hear me out. Here’s what I think – just because it is legal, doesn’t mean it is good for you. Take cigarettes for example. It is legal, but that doesn’t mean it is safe and okay for everyone. The law surrounding child restraints in cars unfortunately have not caught up with best practice recommended by researchers and safety advocates around the world. What this means is that legally, every passenger in the car must be individually restrained. BUT above the age of 7, there is no law that governs the type of restraint the child must use, just a recommendation to use an approved booster seat if they are too small to be properly restrained with a regular lap sash seatbelt. 5-point harnesses are infinitely safer (click here to view crash test video) than regular lap sash belts, even in a high-backed booster seat, for as long as the child fits into it. There are Type-G harnesses on the market now that allow children to remain harnessed pass the age of 8 or 9, depending on their height. Older children are very capable of securing their own harnesses, so it won’t mess with your kiss-and-go routines, I promise! 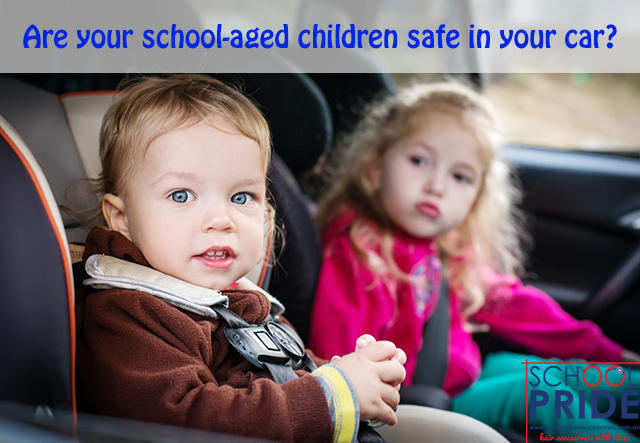 Children aged 12 and under will always be safest in the rear and properly restrained. While the law allows children 7 years and older to use either a booster seat or a seatbelt by itself, a booster seat offers better protection as long as the child fits in it. The purpose of a booster seat is to help ensure proper positioning of the lap sash belt across the child’s body, to prevent serious injuries from the seatbelt itself, so don’t be tempted to skip the booster before their are ready! There are heaps of very helpful resources that offer clear, concise information that can help you make the right decision. My favourite is the Safe Kids Worldwide website, which offers customised recommendations that suit your unique circumstances. The ACRI (Australian Child Restraint Resource Initiative) is another great resource, especially if you are looking for a local trained installer to help you install your child restraint. 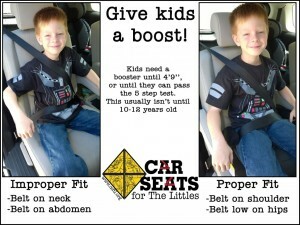 Car Seat For The Littles offers great visuals to help you make decisions. It is based in the USA though, so their car seat recommendations will likely not apply to us in Australia, as we have our own set of regulations for permitted car seats sold in Australia. My mother always say to me, that when you know better, you can do better. Let’s do what we can now, to avoid future regrets. Do you have an older child who is still properly harnessed and/or restrained? What would you say to other parents who didn’t know and are now thinking about installing proper restraints?